A Web site graphic from popular blogger Wellington Grey, based on 2005 figures from the Organization for Economic Cooperation and Development, shows that the number of obese Koreans is ten times lower than overweight Americans. The graphic has proved incredibly popular with netizens as it gives a clear comparison of the obesity index among countries _ it shows the percentage of total populations (aged 15 and above) with body-mass indices (BMI) greater than 30. Three percent of the Korean population are fat, the same as Japan. The United States topped the list with 31 percent followed by Mexico and the United Kingdom. 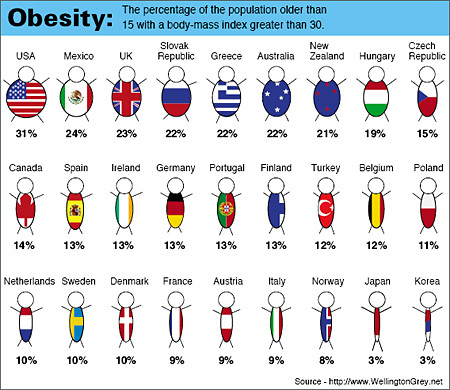 Western European countries generally showed a relatively low obesity rate alongside Asian countries. Nine percent of the population in France, Austria and Italy are overweight. In contrast, countries in the Americas and Eastern Europe have fairly higher obesity indices _ the Slovak Republic is 22 percent, while those of Hungary and the Czech Republic are 19 percent and 15 percent, respectively.